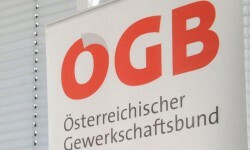 Austrian unionists demand a substantial premium above the inflation rate. They argue that employees should benefit from the strong economic development. Union bosses Rainer Wimmer and Wolfgang Katzian call for significant wage increases in this year’s bargaining round. “We need a substantial increase”, stated Wimmer, boss of the industrial union PRO-GE. “This time, it is not enough to adjust wages just for the inflation rate”, he emphasized. Inflation has recently speeded up and reached 3.5% in July. This article includes a total of 196 words.